On Wednesday, breaking a shocking streak of good news, the Mets announced catcher Travis d’Arnaud has been diagnosed with a partially torn UCL, the ligament often referenced in correlation with Tommy John Surgery. On the surface, as much as I hate to say it, I’m not entirely surprised by this development. When the Mets acquired d’Arnaud from Toronto, he was the top catching prospect in the game, renowned for both his offensive potential and his defensive ability behind the dish. While catching metrics have always graded him as a premier pitch framer, d’Arnaud has never displayed the arm New York felt he had when they traded for him, and, early this season, it was obvious something was wrong as he was struggling to even reach second base on the fly, let alone throw out a potential base-stealer. The corresponding roster move the Mets announced was that Tomas Nido had been promoted from AA, and that’s what first got my wheels turning. The Amazins had signed veteran Jose Lobaton over the winter to provide catching insurance, but they already know what they have in him; a strong defensive catcher whose lifetime .218 Major League average makes it clear he’s solely a back-up. Nido turns 24 years old today, but the motive for his call-up was far from a birthday present; New York feels their eighth-round pick from the 2012 draft is a legitimate catching prospect, and I anticipate him receiving a good deal of playing time, with the club potentially continuing to utilize the shared catching duties they had planned to roll with with d’Arnaud and Kevin Plawecki. This is clearly a real opportunity for Nido to prove to the front office they don’t need to make a move to address position number two on your scorecard, but if I were General Manager Sandy Alderson, I’d already be formulating a different plan, and the gentleman I’d get on the phone was in the building when New York completed their three-game series in Miami Wednesday: Marlins’ GM Mike Hill. What has transpired in South Florida since Derek Jeter and company took over the franchise has been well documented, with the club’s fire sale potentially being even more drastic than the ones that occurred following World Series titles in 1997 and 2003. Miami traded four big name stars over the winter in Giancarlo Stanton, Christian Yelich, Dee Gordon, and Marcell Ozuna, but the one they did not trade is the one that has my full attention. Miami catcher J.T. 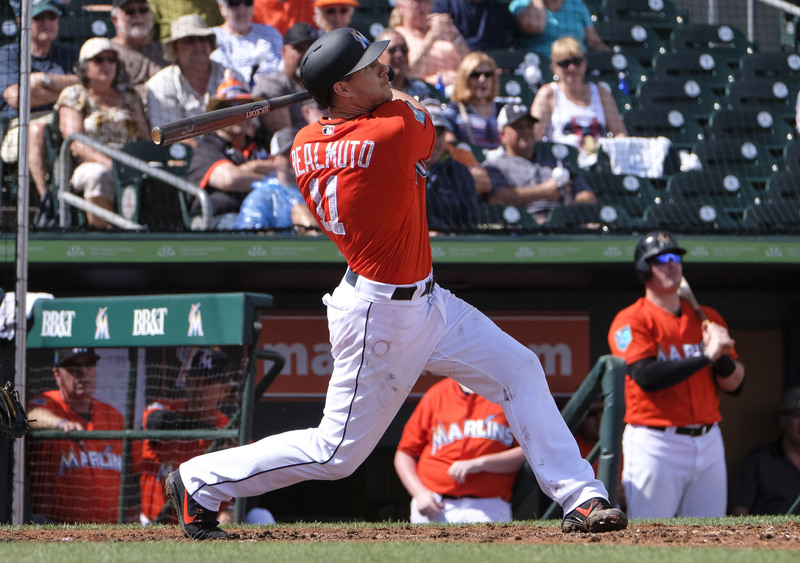 Realmuto is, in my opinion, one of the most underrated players in baseball, a lifetime .280 hitter who plays good defense at a premium position, and is under team control through 2020. He’s exactly the type of impact player New York has not had behind the plate since Paul Lo Duca, and he’s already expressed a clear desire to be the next one traded away from South Beach. The highlight of of the Yelich trade from Miami’s point of view was bringing back young center fielder Lewis Brinson, a tremendously raw but talented player whom Mets fans got their first look at over the past few days. Nimmo is obviously more advanced at this stage of his career than Brinson, and while New York and their fans may be loathe to surrender the fan favorite, looking at the big picture the Mets have all of Yoenis Cespedes, Michael Conforto, Jay Bruce and Juan Lagares under contract for multiple years in the outfield, and they’d be able to survive his departure. Dunn and Szapucki are the Mets’ third and fifth ranked prospects respectively, and while neither has consistently put it together to date, they both have tremendous arms and scouts rave about their potential. Nido was added to the trade because in all likelihood the Marlins would like to add a young talented catcher who could potentially become their own long term answer behind the plate. In all honesty I’m not 100% sure I would make the above trade if I were Alderson and company, but it’s without a doubt something I would give serious consideration too and absolutely discuss with the Marlins. The problem with this list is that the Mets don’t have any real depth in the outfield beyond Nimmo at the higher levels. You really have to go down to High A before you come to anyone who is even a marginal prospect. So there is no help coming from within if an outfielder gets hurt this year. And considering Cespedes and Lagares injury histories and Conforto coming back from a serious injury you have to plan for those injuries. Although I don’t love giving up Dunn and Szapuki, I am okay since there is no guarantee with them at this point. But Nimmo has to be replaced with another player even if that player really has more long term value. Thank you for the feedback, John. I agree with a lot of what you said, and while I also would not want to include both Dunn and Szapucki, as we’ve learned, pitching prospects can be fickle and that’s a chance we’d have to be okay with taking. Regarding Nimmo, I hear everything you’re saying and it would be very difficult to deal him away for all the reasons you outlined. The issue is we really don’t have any other legitimate Major Leaguer who is not an integral part of our team, and the Mets would have to part with something the Marlins could roll out right away. A possible wild card to pay attention to as the season goes on is a potential Justin Bour trade on their end. Bour is a serious left handed power hitter who could undoubtedly help a contending team, particularly one in the American League who could deploy him at DH to ensure at-bats. If Bour were to be traded and Dom Smith continues to play well in Vegas, it’s possible the Mets could try to put together a package centered around Smith, seeing as Miami would then have a clear need at position number three. I should have written in the article and I’m kicking myself for thinking it was too silly at the time, but I also could see Tim Tebow being included in a trade. It would sort of be a joke, but the man is from Florida and the Marlins attendance is nothing short of embarrassing. It’s not hard to envision that team then bringing him up with the sole motivation being to sell tickets.